The photos stored on your computer are the memories and experiences from your life. Travel, family, friends. 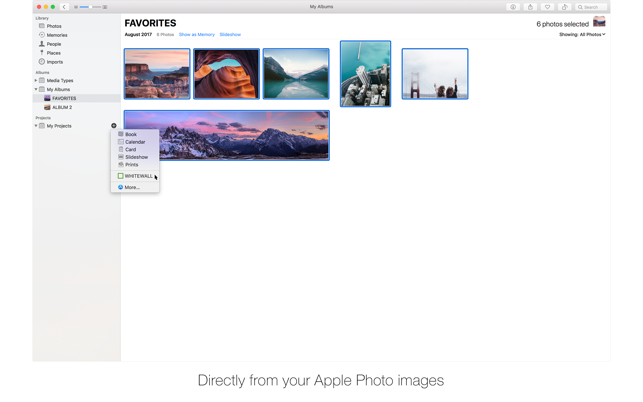 Download WhiteWall’s Extension and move them from Apple Photos to a gallery-quality image. You're just clicks away from turning memories into masterpieces. 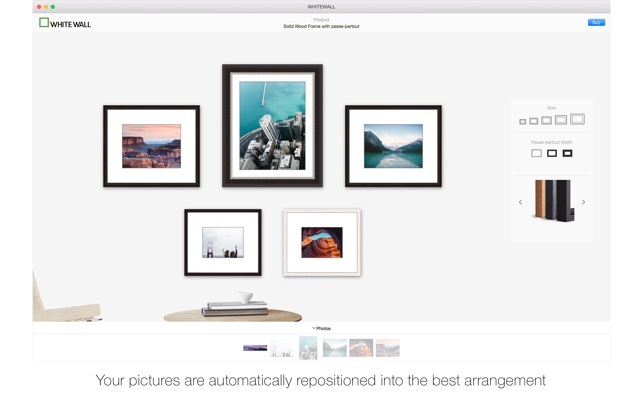 Using the power of Apple Photos, WhiteWall enables you to visualize your images hanging on your wall. Design your own arrangement of photo prints from a selection of your favorite pictures. First, decide if you want prints, mounted prints or framed prints. Then swap out images, reposition them on the virtual wall, change their sizes, and crop them as you see fit. Once you’ve selected the images and arrangement you want, you can make changes to the mounting or framing options you’ve selected. With the traditional frames, you can even choose and size the matting to suit your photo. After that, all it takes is a few clicks and your memories are off to WhiteWall for award-winning production. WhiteWall’s extension moves beyond organizing and printing your pictures. The online lab gives you the power to transform your most treasured memories into gallery-quality wall art you will be proud to display in your home or office. 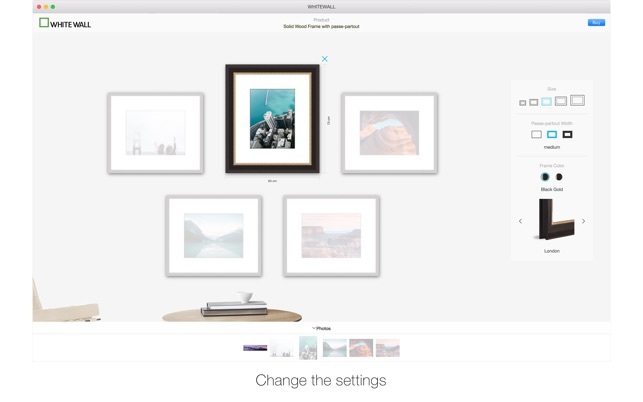 Download today and become the curator of your own gallery wall. Thanks to WhiteWall’s high-end developing and finishing techniques, photographs become unique works of art in the blink of an eye. 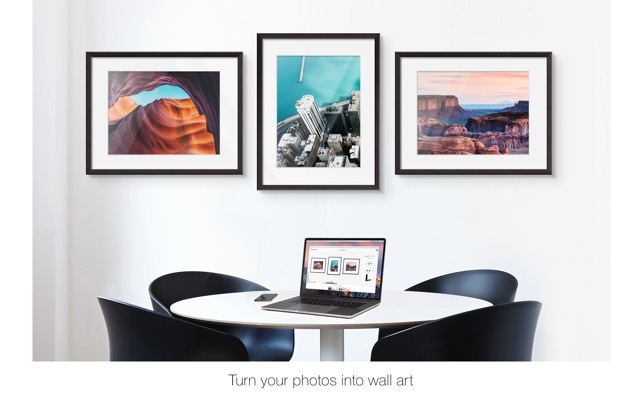 The extension isn't the only way to create picture perfect wall art - there are over 1,000 product variations and more than 80 frames available in custom sizes on wwww.whitewall.com. The combination of state-of-the-art technology and traditional craftsmanship guarantees the highest gallery standards are met. The easy-to-navigate website makes it possible to individually edit images in exact custom sizes without downloading any additional software. At the same time, quality and reliability are the top priorities at WhiteWall; every step of the production process is double-checked right up to delivery. WhiteWall offers worldwide shipping within 10 working days with secure, individual art packaging and a 5-year guarantee. We're working hard to optimize our app with the latest technologies and features. This version includes bug fixing and stability improvements. Enjoy! I don't understand how this app is one that is recommended by Photos. 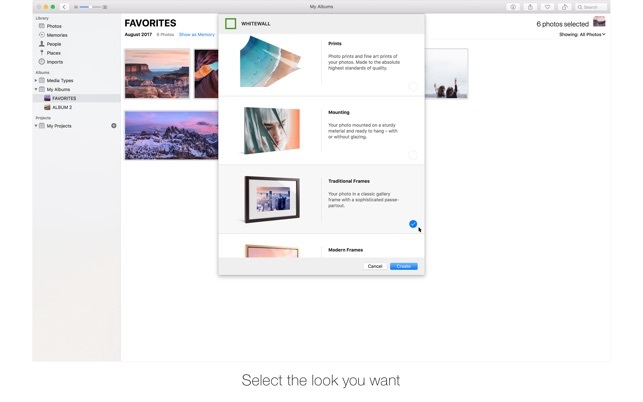 Using a brand-new MBP, I installed this app, and right-clicked on a photo to choose the option to "Create Wall Decor". I chose the print option with Fuji paper. I was then presented with a preiew of a desk and a wall with nothing on it. I changed the options around and still couldn't see an image preview. Closed both Photos and this application, and re-launched Photos. Tried a different photo shot from iPhone and both Photos and Whitewall crashed. I don't even know how this app could have made it into the app store. When I tried to install this before installing MacOS High Sierra, it told me I needed High Sierra first. So I went and did that, and pulled up Photos to try it out. First it wouldn’t give me pricing on a small photo with frame, only on the larger sizes would pricing show. Then it started mixing up the pricing and showing that I could get a fancy print with a frame for a super cheap price. So I clicked on it and got… an error. They need to really tune this thing up before it’s ready for prime time. I know it takes advantage of the new Photos features in MacOS High Sierra, but honestly, the App Store team should have vetted it more before giving it prime real-estate in the App Store. I’ll try again when it’s updated. We are really sorry to hear that. We noticed that the app crashes on some environments and released and update. Hopefully it works now for you. Great idea - terrible execution. This is a fantastic idea for an app, but the execution is terrible. In every projet I attempted to create, at least 1 or 2 photos failed to appear in the frame. Since this is a central feature of the application, it’s completely useless as of September 21st 1.0 release version. Let’s hope for an update soon! We would appreciate if you can send us more details to info@whitewall.com. The App Extension will be updated soon. Copyright © 2017 Avenso. All rights reserved.